BlindGossip – So, now that the lead has been fired, there’s no more show, right? Wrong! It’s much too valuable a brand to simply abandon. So a decision has already been made that the show will go on. And, yes, they will be recasting the lead (although they may introduce him as a new character)! The showrunners are trying to make this all happen very quickly (within the next week) so that they can capitalize on the publicity, and get people excited about the new actor. They also want to send a very clear message to any other prima donna actors out there: you are all replaceable. In case you’re wondering, the four top candidates for this part are well-known male actors who are all over the age of 30, who are all believable as rogues, and – most importantly – who have a history of being consummate professionals. Walking into the lead role of a top-rated show can be daunting, but, frankly, any of these four guys could easily pull it off. Congratulations to Ashton on landing the role! We’re sure he and his 6 zillion Twitter followers are very happy. We know that the producers are very happy with their choice. The formal announcement will be made at the CBS Upfronts on May 18, but will be leaked informally ahead of time to generate advertiser interest. Our Blinders were very good at choosing up candidates to replace Charlie, and you were very accurate in guessing who the producers were considering. Special kudos to Sleepless, who was the first to identify Ashton as a possible candidate! Well done, all! CBS and Warner Bros. Television announced today that Ashton Kutcher will join the cast of the hit comedy, TWO AND A HALF MEN. The multi-talented Kutcher, whose success spans film, television and social media, will join Jon Cryer, Angus T. Jones, Holland Taylor, Marin Hinkle and Conchata Ferrell on the top-rated series. Production on the ninth season of the Emmy Award-nominated TWO AND A HALF MEN will begin this summer for broadcast on the CBS Television Network in the fall. Ashton Kutcher is an actor/producer and co-founder of Katalyst, a new breed of media company that creates original digital media, television and film properties. Katalyst film credits include The Butterfly Effect, Guess Who, Spread and Killers. For television, Kutcher has served as co-creator and producer of MTV’s hit series Punk’d, and The CW’s reality series Beauty and the Geek and True Beauty. Kutcher first gained recognition as Michael Kelso on the Fox/Carsey Werner hit comedy series, “That 70’s Show,” which aired for eight seasons. Kutcher went on to star in a variety of box office hits on the big screen, including What Happens In Vegas with Cameron Diaz, A Lot Like Love with Amanda Peet, Valentine’s Day, No Strings Attached with Natalie Portman, The Guardian with Kevin Costner, and the cult hit, Dude, Where’s My Car. 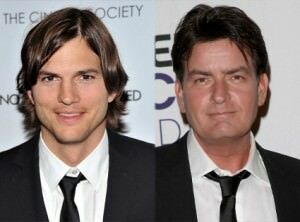 Kutcher stars next in Garry Marshall’s film, New Year’s Eve, out in December 2011. TWO AND A HALF MEN is produced by Chuck Lorre Productions, Inc. and The Tannenbaum Company in association with Warner Bros. Television. Chuck Lorre and Lee Aronsohn are the series’ creators. FYI, CBS and Warner Bros will be splitting the cost of Ashton’s salary of approximately $1 million per episode.